Jim Adams with NM Historical Society President Mary Chrastil. Boebel with NM Historical Society President Mary Chrastil. On April 21, the North Manchester Historical Society honored 75 volunteers at a reception at the NM Center for History. April is National Volunteer Month. The volunteers served as docents, researchers, exhibit fabricators, program committee members, board members, preservation group members, collection managers, administrators and in many other capacities. 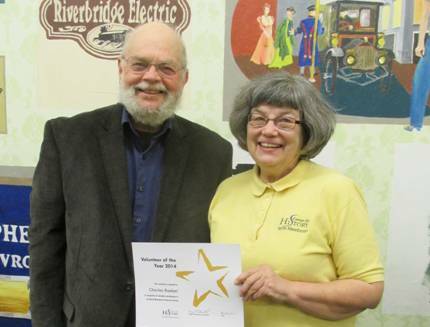 This year marks several significant milestones for Historical Society volunteers. The number of volunteers increased by 27% to 75. They recorded 10,379 volunteer hours from January 1, 2014 through March 31, 2015, the equivalent of 5.0 Full Time Employees. Total volunteer hours since the Center opened have now passed the 50,000 hour mark at 54,773 hours. Using the guidelines provided by The Independent Sector volunteer website, the 54,773 hours translate into volunteer services valued at $1,180,914. In other words, Historical Society volunteers have donated over one million dollars of service, another milestone. 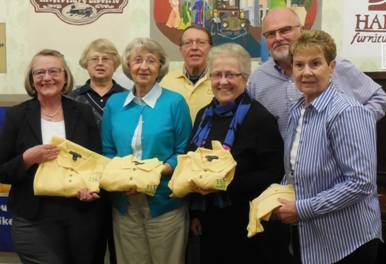 Volunteers who have accumulated 100 hours of service received a polo shirt with the North Manchester Center for History logo. Those achieving this milestone this year were: Jane Ann Airgood, Barb Amiss, Tom Brown, Paula Dee, Bernie Ferringer, Jim Garman, Ruth Hawley and Carolyn Underwood. The Volunteer of the Year award was given to Dave Randall. According to Mary Chrastil, NM Historical Society President, “Dave always says yes when asked to help out. The problem is, he doesn’t always record the hours and hours he puts in.” A long-time board member, Randall has also served on the Center’s building committee. He does construction work, recycles, helps with exhibit fabrication, and most significantly helped refinish the beautiful hardwood floors in the Center’s new windows. 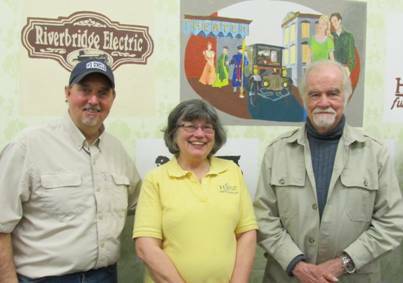 Volunteer of the Year awards also went to James R. C. Adams and Charles Boebel for the video documentary they are creating on North Manchester. According to Chrastil, “producing a video is a time-consuming task, especially given Jim’s and Charles’ creativity and standards of excellence. We have interviewed scores of people for this video, and have interwoven source material from historical records and 1938 and 1985 videos. Once we started the interviews, we realized that they will also serve as a wonderful video archive that will benefit researchers for years and years; but creating the archive added additional work. Each of our honorees has given about 240 hours to the project so far.” Guests at the reception were treated to a 10-minute clip showing the beginning portion of the video. Chrastil noted that people volunteer for many reasons, such as helping others, helping the community, and making North Manchester a great place to live. The North Manchester Historical Society does business as the North Manchester Center for History, the Thomas Marshall House Museum and the Historic Homes Preservation Group; they are all not-for-profits who depend almost exclusively on volunteer support.